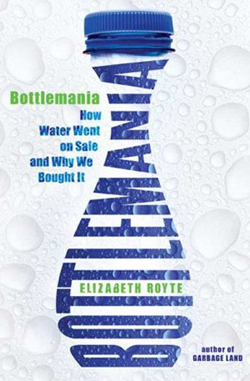 The battle between a group of Maine villagers and mighty Nestlé is the hook upon which Elizabeth Royte hangs Bottlemania, an examination of the pros and cons of consuming bottled water. It’s a huge issue. 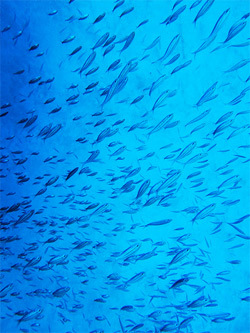 Sales of bottled water surpass those of milk and beer; Nestlé’s 2006 profits from its water division were $7.46 billion. And that’s only Nestlé. Coke and Pepsi each market purified water, reaping similar yearly profits. Hundreds of other companies both large and small are earning big bucks from spring water, extra-purified tap water, even bottled rain water that never touches the ground. Among the questions Royte asks are these: Why are we willing to pay for something we can draw from a tap in our homes? What does the consumption of water from individual plastic bottles say about our modern culture? And most important: Is this practice environmentally sustainable? Royte traces the short history of bottled water as a commodity in America. Before Perrier made its trendy entrée into grocery stores in the late 1970s, bottled water was a rare, localized product generally sold in the vicinity of spa towns. In the 1980s and 1990s, a hip new generation turned bottled water into a fad. Between 1990 and 1997, sales soared from $115 million per year to $4 billion. This fad hasn’t passed. 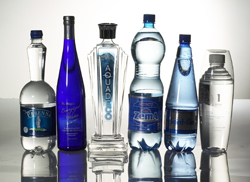 Advertising campaigns and chic packaging promote bottled water as healthier, better tasting, portable, dependable. Is this true? Probably. Is it worth the extra money, wasteful packaging practices, and the possible depletion of underground aquifers that some people depend upon for their municipal water? Probably not. As Royte examines the various ways municipal water is gathered, treated, and sent into homes, she comes to the reluctant conclusion that even the best tap water can contain the occasional whiff of fertilizer components, microbes, heavy metals, bacteria, lead from old pipe fittings, even arsenic. What makes tap palatable, however, is its regulation by the Environmental Protection Agency. Every municipality must test its water annually and issue a report to the public. Bottled water falls under the umbrella of the Food and Drug Administration and is tested far less rigorously. Even so, municipalities have leeway in their testing procedures. They can wait until certain times of the year when their water supplies are naturally better (winter as opposed to summer), and they can average their bad numbers into their good numbers over a 365-day period. On the other hand, the very best of Mother Nature’s geologic filtration systems cannot leach every contaminant from groundwater. Bad stuff may be in those plastic bottles, too — and that’s before one considers the nature of the plastic container itself, what chemicals may leach into the water when a package sits in storage or on a store shelf for a few months. The most pressing issue facing the bottled water industry is sustainability. Royte focuses the bulk of her work on the troubled future of world water supplies. Extrapolating from the growth of plant matter on the floor of a Maine pond, possibly due to aquifer depletion, Royte speaks to global conservationists and small-town activists who are allies in the tricky politics of water allocation. The author sits in as the citizens of Fryeburg, Maine vote down an ordinance that, over time, would allow Nestlé to dominate the local water supply. It’s a hollow victory. With such staggering profits to be made, Nestlé can afford the best lawyers and maneuver at will, while its citizen opponents struggle to pay for hydrogeological studies and their own legal teams. As the saga continues, the huge tanker trucks rumble through the Maine villages, day and night, week after week, year after year. Anne Janette Johnson is the author of Defining Moments: The Scopes Monkey Trial (Omnigraphics Press, 2006). She writes daily on issues pertaining to the separation of church and state at her website godsrbored.blogspot.com.